Ever notice that whoever dies, they seem to have been LeAnn Rimes' best friend? We finally figured out the washed-up country crooner's game. The second news is revealed about someone who died, LeAnn is one of the FIRST to post about it on her twitter. Then, when the media does a search for one of their "Hollywood remembers 'X'" features, low and behold, there's LeAnn Rimes' tweet! Because she is glued to her phone, she is especially adept at playing the DEATH game, kudos to you, LeAnn, you're quicker on the draw and full of more fakery than the rest of Hollyweird! 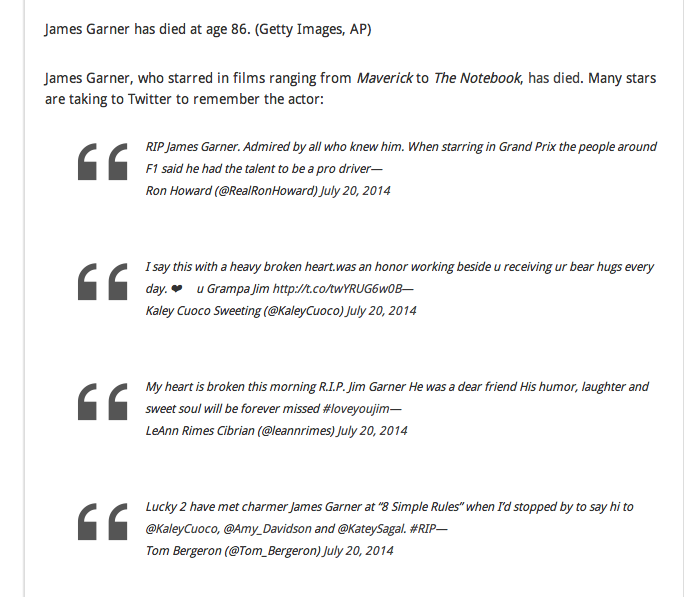 Notice how the other people quoted, site the way they actually KNEW James Garner, but not LeAnn!